- seem huge and unconquerable. - feel like a threat to our very lives—certainly to our enjoyment of them. - fill our imaginations with worst case scenarios. - present themselves persistently, day after day. There's no end in sight! If we were reading the story of David and Goliath for the first time and saw David coming on the scene, we would not foresee what is ahead. For he is young, a shepherd not a soldier, and on a lowly errand for his dad. Of course we know how the story continues. 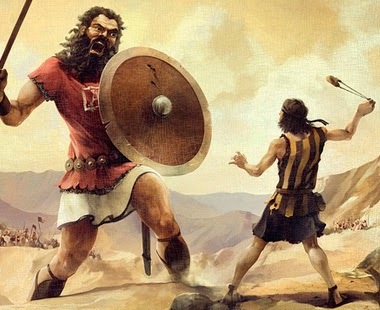 How it's David's outrage at Goliath provoking and defying "the living God" that spurs him into action (1 Samuel 17:26). And it's his skill with weapons, albeit humble ones, along with his complete trust in God that has him going out to confront this 9 foot, 9 inch specimen (1 Samuel 17:34,37). As we pray for relief from the intimidation of our life giants, let's also renew our faith in God. Let's start looking at life's "I defy you" moments not as the beginning of seasons of fear, worry, and anxiety but as opportunities for God to show Himself strong on our behalf by bringing us out of or through them. And let's not be surprised when He does it through entirely unlikely and unexpected people or events. PRAYER: Dear God, please help me to look at challenging circumstances not through eyes of fear, but eyes of faith. Amen.